The 1 connects Bolton in Greater Manchester with Blackburn in Lancashire. It runs every 15 minutes weekday daytimes, 20 minutes Saturdays and hourly in the evenings with a half-hourly daytime-only service on Sundays. Additional short journeys run between Blackburn and Darwen only. This service is operated by Transdev Lancashire United. Click here to discover more bus routes in the North West. 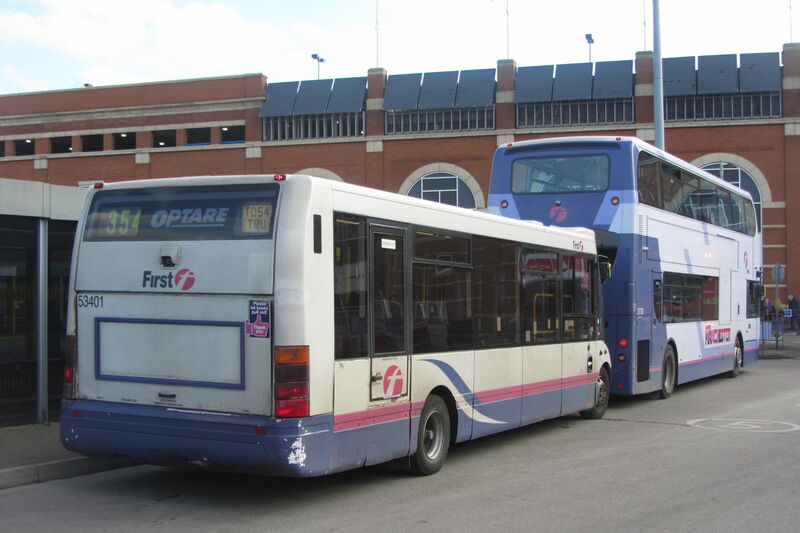 The 1 starts from Moor Lane Bus Station in Bolton, using stand S most of the time, but switching to stand Q after 1900 Mon-Sats and all day on Sundays. The 1 then runs along the Blackburn Road through Bolton's northern suburbs, including past Asda. Why not try Darwen's best rated restaurant: Resh's on Blackburn Road? Get off the 1 at Lloyd Street. The 1 starts from stand 15 at Blackburn Bus Station. A new bus station is due to open in January 2015, so if travelling after then, check local publicity to see where the 1 goes from. You can find the full timetable on the websites of Transdev or Transport for Greater Manchester. If you're travelling further afield on Transdev routes, then the Gold One Day ticket at £9 for an adult is also valid throughout route 1. For shorter journeys, the SpotOn One Day ticket at £4.20 is valid on the 1 between Blackburn and Darwen Cemetery. It's also valid on all Transdev buses within Blackburn and Darwen. If you're only going to be travelling within Greater Manchester, which on the 1 means between Bolton and Moss Cottages in Dimple, then you can use System One's range of multi-operator and multi-modal tickets, which are valid on all buses in Greater Manchester. An adult off-peak any bus Day Saver is currently £5.20. The TfGM Wayfarer day out ticket at £11 is valid on the 1 between Bolton and Darwen Town Centre. It's valid throughout Greater Manchester and into parts of the neighbouring counties, including most of the Peak District, on buses, trains and trams. It can't be bought on the bus, so make sure you buy one before you board. If you're connecting by train, then Greater Manchester Plusbus tickets have the same validity as the System One Day Saver mentioned above, which on the 1 means Bolton to Dimple only. Blackburn, Darwen & Accrington Plusbus has the same validity as Transdev's Spot On tickets, which on the 1 means Blackburn to Darwen Cemetery only. Extract of rail map showing the 1's route in yellow. First 533 provides an alternative route between Bolton and Egerton. Within Bolton, additional routes along Blackburn Road are Arriva 534, 535, 537, 538 and 539. Between Darwen and Blackburn, you can also use Transdev 2 via a different route. For direct journeys between Bolton, Darwen and Blackburn, the only alternative to the 1 is the train service operated by Northern Rail. Timetable here. An adult single from Bolton to Blackburn on the train costs £6.10 and an off-peak (travel after 0859 weekdays, anytime weekends) return costs £6.30. A Duo return ticket is available off-peak for two adults for £9.40 (excluding weekends in December). See more train fares here.